As a small-business owner, choosing whether to join the app-development club can be a difficult decision. You may feel like you have to build an app and “go mobile” to stay competitive, but you’ve probably heard that apps are expensive and time-consuming to develop. More and more users are dumping desktops and laptops for tablets and cell phones, so it makes sense to optimize the online experience for them. But is it really worth the effort? Can’t they just use their smartphones to access the website you already have? It’s a tricky problem with no single cut-and-dried solution, but increasingly even the smallest businesses are saying yes to the mobile question. I’ll take you through the challenges—and the potential payoffs—in a moment. 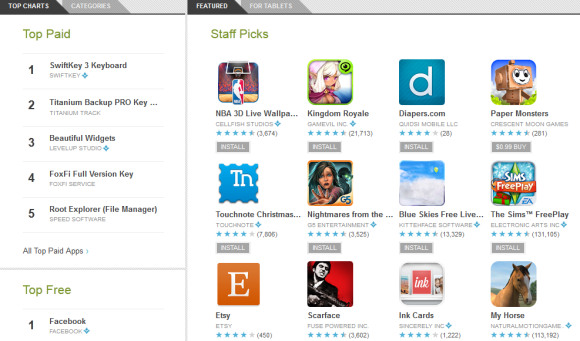 The Google Play Store is the go-to market for Android apps. That said, the argument for building an app is compelling. Mainly it relates to the way today’s phones are designed. An app gives you much more presence on the phone than a bookmark on that phone’s browser does. Rather than forcing the user to launch the browser and find your URL, an app is always there, front and center on the mobile desktop. Your business is constantly in mind, whether the person is using the app or not. The goal, of course, is that eventually that user will hit your icon (even if by accident). That kind of thing just doesn’t happen with mobile websites. A ComScore study recently confirmed that 82 percent of “mobile media minutes” are spent with apps instead of with the browser. The other key advantage of mobile apps: Your mobile-friendly website can’t really do anything extra that your regular website can’t also do. Mobile sites are generally streamlined versions of the site you already have; the functionality is the same. But apps can be designed to do anything. Want to turn your business’s products into a video game or push notifications to customers? Build an app, not a mobile website. Before you spend the time and resources to build an app, however, consider what value a dedicated app can bring to your business. If your app doesn’t tap into the extra benefits the format provides to deliver a particularly unique or helpful experience to your customers, you might be better off devoting your resources to a top-notch mobile website, which—as I outlined above—would be both universal and (likely) cheaper. That said, while there’s no doubt that you can find horror stories in the app-building world, no one we spoke to said they regretted building a mobile app, even if they didn’t quite get the results they wanted. This may sound like a cliché, but any business can build an app. It doesn’t matter how visible you are to consumers. All you need is a thoughtful approach toward adding some value for your customers. For example, you wouldn’t expect a small vitamin manufacturer to have much reason to create a mobile app, but Nordic Naturals did. Project manager Cecile LaRiviere says Nordic’s app lets you find stores that sell its products, order vitamins online, and—a crucial addition that helps it remain “top of mind"—set reminders to prompt users to take their vitamins and to reorder pills. Plus, the app is stuffed with literature about the value of omega-3s, helping to enhance the awareness of and interest in its primary product line. On top of that, app users get notifications about new product launches.